Bromeliad plants come in a huge variety of sizes, colors, and shapes. They have adapted to grow many different places, and I am fortunate to live among many thriving bromeliads on the Big Island of Hawaii. The leaves on a bromeliad grow in a rosette shape, which helps pool water that the plant can use. The pools of water also attract insects and small animals (such as salamanders and frogs), which can help to create a symbiotic relationship. All bromeliads have scales on their leaves that absorb water and nutrients from the air. This helps the plant to be able to grow in a variety of places. 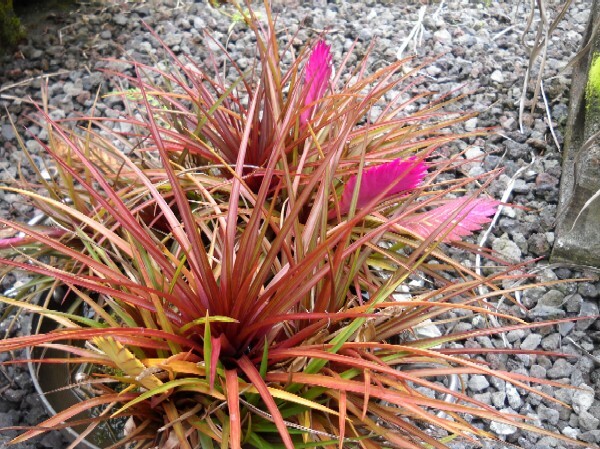 Not all bromeliad varieties rely on soil and complex root systems to bring them what they need to survive. And bromeliad plants really know how to survive. 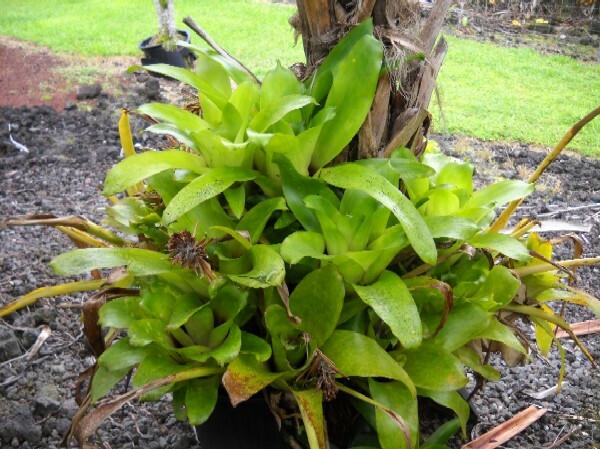 Bromeliad care is for the most part very easy because they are such hardy plants. There are three types of bromeliads: Pitcairnoideae, Bromelioideae, and Tillandsioideae. The first, Pitcairnoideae, have spiny leaves. They usually grow in the ground and have a root system that brings them most of their water and nutrients. 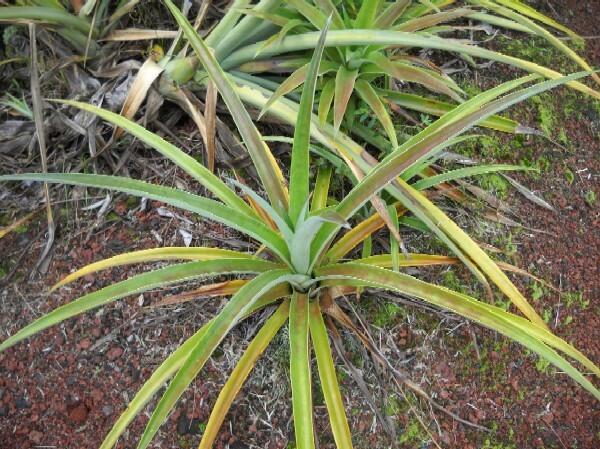 The scales on the leaves of this type of bromeliad are not needed so much for water absorption, but instead help to protect the plant from extreme temperatures. The second type, Bromelioideae, also usually have spines on their leaves. This type contains an inferior ovary. It also produces fruit that is consumed by people and includes the most well known bromeliad: the pineapple. What I found most interesting about the pineapple was that instead of planting seeds to produce more, you place the top of the pineapple fruit in the ground and a new plant will grow from that. I have many new plants and delicious pineapples growing in my yard from this method. The third type, Tillandsioideae, has spineless leaves. It also has the largest variety of colors and flowers. This type can be found growing in unusual places. It has adapted to grow on trees, rocks, and even on telephone wires. It relies heavily on absorbing water and nutrients from the air through the scales on its leaves. This type includes Spanish moss. Bromeliads can be found in many different countries and climates. They are used for food, but mostly for ornamental purposes. They are unique and beautiful in their variety of shapes and colors. I hope you experience them for yourself, whether growing in the world around you, or taking care of them in your own home. And now that you are done reading about bromeliads, please check out our kona coffee review. We will be adding more reviews of this amazing elixir very soon.